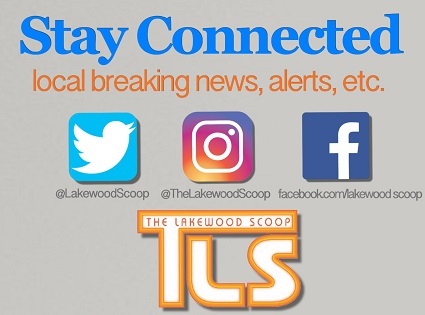 See new information released to The Lakewood Scoop this afternoon. There are 59 Comments to "OCHD gives Measles Outbreak update and clarifies School Exclusion Guidance"
One thing that caught my attention is the advice for proper hand washing. Everyone in school or playgroups should be washing their hands with soap and water before eating snacks or lunch. When coming home from school, work, yeshiva, etc. the first thing everyone should do is go wash their hands with soap and water. so do you mean that when Dr. Shanik claimed otherwise in the name of the Board of Health that …. Dr. Shanik was saying the truth. 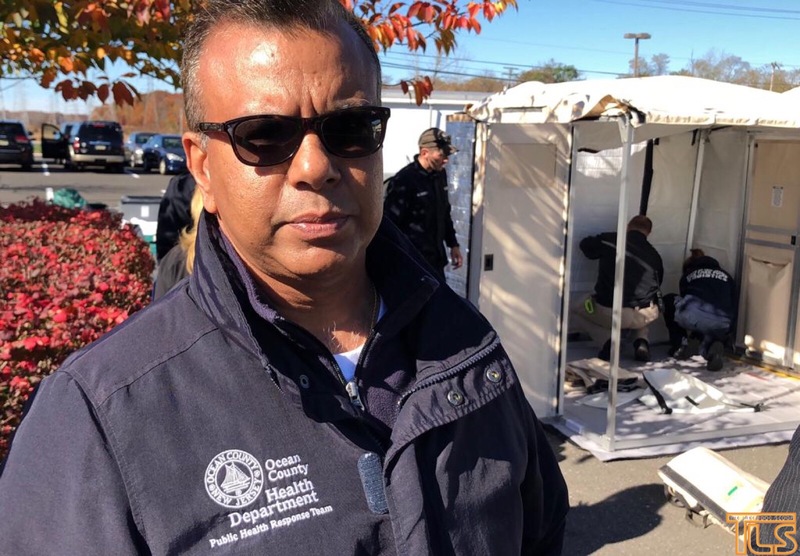 The Ocean County Health Dept. does not have the time to get involved with law suits. So all the pro vaxxers who have been screaming Rodfim, Lo Saamod, Don’t listen to the Rosh Yeshiva, The government makes the rules and we have to follow them Etc. Etc. Etc. What do you say now? Seems the government is recommending shots but clearly says you may not keep an unvaxxed kid out of school. So now all the pro vaxxers will lose their minds and the comments will become “what does the government know anyways” “how dare the goventment allow unvaxxed kids to expose my kids to this disease” etc. etc. etc. Thank you for this! I was waiting for more clear guidelines that actually make sense! 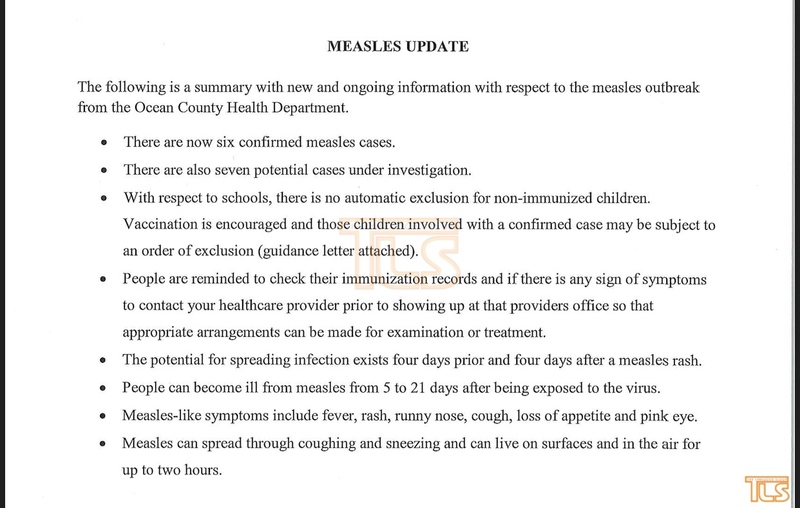 I have been following most of the posts related to measles and would like to offer these comments. If measles is so contagious, and it is contagious from four days before symptoms develop, shouldn’t there more than six cases confirmed since October 24, when lakewoodscoop reported the first case? Even if you count in some more cases that are going unreported, shouldn’t the figure be much higher now, two weeks after the first confirmed case? Is this something to panic about? John Hopkins mysteriously removed the line about not having recently vaccinated recipients of live virus vaccines (such as MMR) visit immunocompromised (cancer) patients at home. Did they think people may figure out that the live virus can shed? Some people who get the vaccine develop mild symptoms of measles a week or two later. Are doctors distinguishing between real measles and this form of illness? And why is it not being reported whether or not the measle cases confirmed were in the vaccinated population? The MMR manufacturer insert says not to give two live vaccines within a month of each other, but Chemed says they are following “established clinical guidelines” and allowing those recently vaccinated with the rotavirus live vaccine to get the MMR even within a month. Can they tell us the source of those guidelines so we can feel more comfortable about it? The MMR manufacturer also states that the mumps and rubella part of the vaccine have not been tested for safety in the six to twelve months age group, and that this age group may fail to respond to the vaccine. Those children who are getting the MMR earlier than twelve months, will end up getting three doses of the vaccine instead of the usual two that were the usual protocol. Has this been tested for safety? It would seem to me that parents should have the right to not go along with these new protocols if they are afraid it may harm their children in the long run – harm worse than a case of measles. So those schools that excluded children will allow them back? and a certain school nurse is more machmir than everybody put together Hashem Yerachem. Please stop allowing all these anti vaccine commenters from posting specifically Goldy who seems to have nothing better to do then constantly post her lies and misinformation it is irresponsible and dangerous you have a duty to not allow people to post things that are outright lies and distortions especially when we are talking about people’s lives here. LPD, I am sorry that you are so upset. Please let me know specifically which things I posted that you feel are lies and misinformation. This way I can post the source material where I got that information from. Thank you very much and all the best. Although the OCHD has not YET mandated exclusion from school of unvaccinated children, I strongly encourage the school administrations to do the right thing and exclude all children whose irresponsible parents are not willing to properly care for their children and get them immunized thus risking killing, not only their own children, but others as well much as the parents in Yerushalayim killed their child. School administrators: don’t be blinded by the money those parents bring in-get unvaccinated kids out of school NOW! Call the OCHD to find out if this is legal. I did. The schools may not do this. The OCHD does not recommend it, and they may not do it, and they are very upset that Dr. Shanik said in their name that they changed their recommendation. To be clear, there is no such term as “pro-vaxxers.” There are only “anti-vaxxers” and “normal parents.” For you pro-vaxxers, home-school your children or leave Lakewood. No one wants your kids in our heilige schools! You don’t belong here. We don’t want to risk your killing our children. It’s time for you to leave! My kids are vaccinated. Vaccines are 100% effective for 97% of those vaccinated. Of the last 3%, the chance of serious injury is extremely unlikely. I welcome all unvaccinated children to come to my kids school & learn. Let’s stop this hysteria. In theory, you may be right. B”H when my son came home from kindergarten with chicken pox for which he was vaccinated, it was a mild case, and the rest of the family was immune (either vaccinated, or had it previously). However, had anyone in the family been immuno-compromised, it could have been very serious. At a later time, when a family member was undergoing chemotherapy, the pediatrician wouldn’t vaccinate this child without the oncologist’s ok, and recommended holding off on a live vaccine for a few months to avoid the potential of introducing something that could be extremely dangerous to the other ill family member. Relying on herd immunity works only when the herd is immunized. Once you have too many people not vaccinating and relying on the herd, the herd as a whole no longer has the likelihood to prevent those who cannot be immunized from getting sick. And to those, it can be extremely dangerous. Baruch Hashem measles is not a deadly disease. For most people it is very not geshmak, but by no means deadly. Should a person contract the measles, make sure to drink a lot and take a lot of vitamin A. May we all be gezunt! That is true for “most people”. For many, though, who are not able to be immunized, or have other medical conditions, the likelihood of serious complications can be very high. And from the common cold. Should we exclude those with the common cold from school. And, if school administrators won’t exclude unvaccinated kids, then they owe it to us to publish the names of the unvaccinated kids so that we can keep our children away from them. This will also help provide protection to the schools from lawsuits should a normal child become sick from an unvaccinated child who was allowed in the school and became sick with measles and transmitted it to others. The msg Dr. Shanik gave in name of OCHD made me wonder , why wouldn’t the OCHD contact schools themselves , do same thing in public schools etc , what is he their ocean county rep ? Why did it take so long for this letter to come out? Could it be there was some arm twisting by higher ups? Measles. In 1980, 2.6 million people died from measles. Measles is a VERY deadly disease. In developed countries, fewer people who get it die because we have better medical care but in the US prior to vaccine availability, people died here too. Between 2000 and 2016, measles vaccination has prevented an estimated 20.4 MILLION deaths! So, sorry, Anonymous, you’re very wrong!!! When I was little I remove everyone had measle party nobody went hysterical and one you get it over with after few days you are immune for life ! Concerned and “normal”: sorry, you’re wrong! We who want to keep high-risk children out of school are the ohavei Yisroel – it is those who won’t vaccinate their children who are the sonei Yisroel, and also not being very good parents by putting their children at risk. 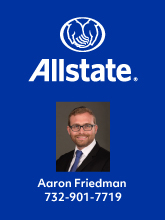 This is not a question for Askonim and Rabbonim-it’s a question for doctors and scientists. And all of the reliable medical organizations (ACIP, AAP, AAFP, etc.) who have reviewed thousands of studies and seen millions of patients, are unanimous in recommending vaccination as the only way to prevent these deadly diseases. So, anti-vaccinationists are the real sonei yosroel by putting others at risk. There are many more but these should suffice. Why is this a question for doctors and scientists? And how about the parents that saw their normal, happy, engaging and verbal child becoming PDD because of the MMR. will you also just tell them to speak to the doctors and scientist being that your ahavas yisroel is so remarkable? That is incorrect. 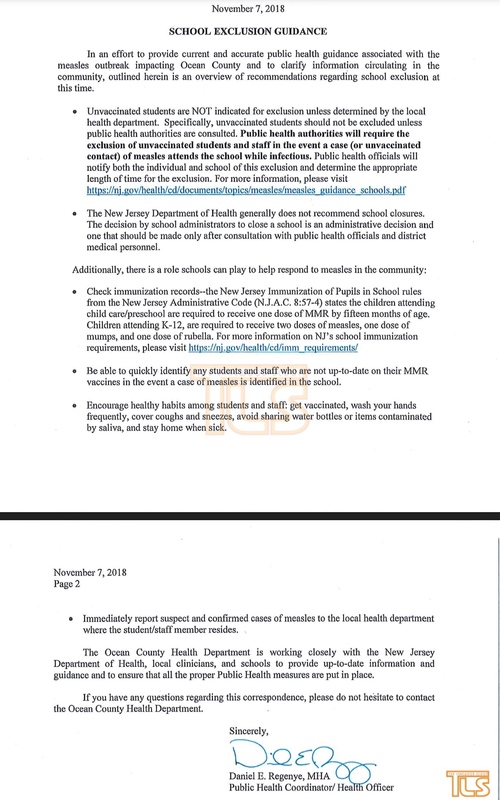 Actually the NJ legal regulations clearly state (NJAC 8:57-4.4 (b) ) that even when there is no outbreak, religiously affiliated schools and day care centers always have the authority to grant OR WITHHOLD a religious immunization exemption from any pupils attending their institution without challenge from any secular health authority. The code (d) goes on to specify that during a vaccine preventable outbreak any school has the right to exclude any pupil with a religious exemption. So it’s pretty black and white that the schools have broad discretion here. There are many dr who are talking about dangers of vaccines and most of us just saw with our own eyes what it did to our children . I personally lost someone coincidentally right after taking vaccines and head Dr r in hospital where he was admitted said it can possibly be triggered by reaction to the shot , coincidence ?? Find online interviews of Dr. Paul Thomas and Dr. Larry Palevsky – who were originally pro-vax pediatricians but are now taking a more conservative approach. 1) how about a school that picks and chooses who to accept (relatives or friends) without immunizations and who not to accept (regualr run of the mill parents). 3) what constitues a outbreak?? 1) surely illegal, but who wants to take their school to court? 3) The CDC defines an outbreak (of measles) as 3 or more linked cases, So this is being called an outbreak by the Department of Health. Though not the epidemic or emergency like Lakewood is being led to think. There have been 11 (reported) outbreaks in the country in 2018 before this one. 142 cases in all (before this one). Please! I also have a child with PDD!! Why in heavens name do you think the shot caused it??? Even if you diagnosed him shortly after he had the shot can you in certainty say that it was a direct cause????? This just shows. That the pro vaccine drs took this opportunity to further their agenda to get more ppl to vacinate. We have to differentiate btwn real danger to getting ppl to vacinate. P.S. there is a diff between antivaxxers to caution vaxxers. I actually enjoy reading what goldy writes. Vaccine as with many things are not so black and white. I can tell you with 100% certinty that the PPD is either genetic or environmental. It is absolutely not related to any vaccine. How does blaming mmr make Anything better?? What proof do you have to say that with 100% certainty? Please cite it. See what leading scientists are discovering about aluminum in vaccines. Robert F. Kennedy, Jr., sent a letter to Dr. Paul Offit in October inviting him to a debate on the safety of vaccines with three scientists mentioned in the article, since Dr. Offit said the only ones who know about vaccine safety are scientists. Perhaps Dr. Offit will accept the offer and then we can hear evidence from both sides. vaccines are environmental…. if not then what does environmental mean? air and water? The regulations indicate that an outbreak designation is determined by the health department. Such designation has been made by the OCHD. At that point any school has the right to choose to exclude or not exclude non-vaccinated pupils. The schools would do well to reconsider any religious exemptions they accepted in the fist place, since they are being misused to carry out non-religiously rooted beliefs. That is something the law expressly disallows. I agree with the person who said Goldy’s posts should be withheld. If she (in her last post) is trying to discredit all of the major medical organizations that deal with children, she clearly doesn’t know what she’s talking about. Obviously, we can all just ignore her, but I agree with the commenter that her lies and misinformation Would best be withheld. I was just pointing out the conflict of interest when it comes to vaccines and these organizations. If you look at the articles you will see facts not lies. Due to the right of the public to see certain information, we are able to see who gives money to who. I am not discrediting all the major medical organizations – I am just pointing out that confilct of interest does exist and maybe it sometimes influences decisions when it comes to vaccine recommendations.I did not mean to condemn these organizations across the board or on all medical issues or decisions that they make. I am sorry if you took it that way. have you ever looked into the credentials of the “reputable medical doctors and scientists” that are supporting your cause? I did look into the first 2 names i came upon. needless to say, many of those patients died shortly after. one man had come in with chest pain, shortness of breath, etc., for 4 IV treatments of hydrogen peroxide, and dies shortly after of a heart attack! Another came in with xrays showing pneumonia, shortness of breath, vomiting with blood, chest pain, etc. got HP treatment along with vitamins. A patient came in with some bone/joint pain…. had bone cancer!! next dr is one that really baffles me! she had a bunch of impressive looking letters after her name. looks really great! but try to find out what those letters mean? one of the titles means some kind of degree in engineering/building field. another, when googled, gets you one result in at least 10 web links…all to this dr!!! seems like she is the only person in the world with these credentials. who gave her these credentials? who labeled her? Why was she thrown from court for lying and no knowing how to keep quiet and behave in a courthouse, when she claims in her talks that she fights for antivaxx rights in court ALL THE TIME and wins all the time? So she came to court and used an article that she had published in a reputable mediacal journal as proof of her vast knowledge. when was it published? what month? she cant remember/ what year? dunno. in the end, it was… A LETTER TO THE EDITOR!! Is this where you take your information from??? is this called making informed decisions? educated decisions?? by learning from a buch of criminals and quacks who actually made it through medical school, but whose intelligence level doesnt match their education level??? Can you please indicate which two doctors you are referring to? Thank you. Being pro or anti vax shouldn’t give anyone the right to be obnoxious to others, just because of the anonymity of the internet!!!! Thanks, Shoshana. I totally agree with you. Maybe Hashem is testing us to see how we treat each other even if we have different opinions on things. I have always tried to write respectfully on this site and hope that I have succeeded in doing so. You can dislike someone’s opinion, but it is not appropriate to dislike the person. Everything comes from Hashem – especially our health. May we all be blessed with good health till 120, b’ezras Hashem ! shoshana, you are 100% correct! and I deeply appologize if i came across as obnoxious to others. please forgive me. I truly do not have any hatred or anger towards anyone here. I have alot of hatred and anger towards the higher ups that are knowingly misleading hundreds, if not thousands, of individuals that truly are trying to do what is right. Maybe Lakewood residents should be quarantined until he outbreak passes, putting other towns healrh at risk isn’t right. This could quickly spread out of control. And when leaving the country to visit one with a measles problem please vaccinate yourself before you go, it’s not hard being a responsible adult. Why are people putting any-vaxx literature on resident’s homes in Lakewood? Doesn’t the herd immunity protect them in they aren’t giving the vaccine? What is the point of spending money to convince others? and yes, I do believe that the current situation is insaly overrated and the hysterics are completely uncalled for. But, I also believe that these vaccinations must happen in order to stop the measles cases from multiplying.